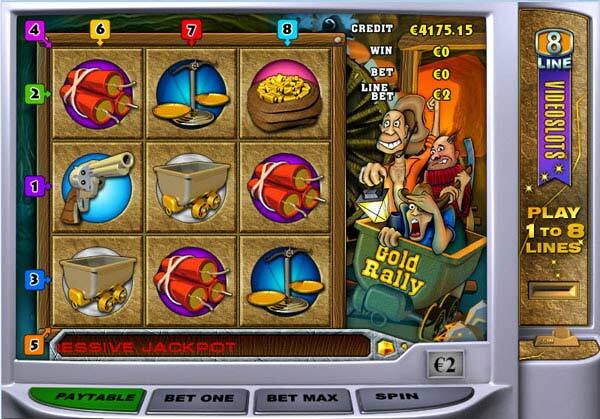 The object of Gold Rally is to obtain a winning symbol combination by spinning the reels. · Select the number of paylines you want to bet on by clicking on the Bet One button or the line number on the upper and left edge of the reels. When you click on line number 5 for example, you also select lines 1-4. Each click on the Bet One buttons selects one more line. Click Bet Max or line number 8 to select all paylines (or less, if you do not have enough balance). Remember that your total bet (the amount you spend on the game round) is line bet multiplied by the number of lines selected. Clicking Bet Max also spins the reels automatically. · If the reels show a winning combination after they stop (along a payline you bet on), you win according to the winning table. Click the Paytable button to see the paytable, if you wish (in the paytable, click Next and Back to scroll between pages). Close the paytable by clicking the Paytable button again. If you win on multiple paylines simultaneously, your winnings are added up. The Bonus round symbol and the Scatter symbol are exceptions to that rule. Read more about the Scatter symbol and Bonus round symbol below. The tables show a certain number for every symbol combination that pays. Multiply your line bet by that number and you get the winning amount. If you have winning combinations on multiple lines, add them all up to get the winning amount. Please note, that the one Horseshoe symbol combination and two Horseshoes symbol combination have to start on the leftmost or upmost reel (depending on the payline) to win. When you enter a bonus round, follow the instructions on the screen. You will be paid a prize according to the choice(s) you make. The “You win” sign shows your total win – if you play several rounds, wins from all rounds of the current bonus game are added up. After the bonus round, you can check the Game History, where each round’s winning is shown on a separate line. The scales symbol is a scatter symbol – when you get 5 to 9 of these symbols on the screen, you are paid according to the table shown on the winnings table. Scatter win is calculated by multiplying the number on the respective row of the scatter paytable with your total bet. The symbols don’t have to follow any payline. Scatter wins are added to payline wins (if you have any). A certain percentage of every bet players make, goes to the progressive jackpot pool. You win the Progressive Jackpot by getting 9 scatter symbols on the screen in one round, while playing for Max Bet.